In the mountain forests of western Colorado, archaeologists and tribal members have recorded scores of sites that contain the remains of hundreds of wickiups, cone-shaped wooden structures built by the Ute, or Nuche, people more than a century ago. Archaeologists have found and documented at least 366 wooden features at 58 sites so far, along with other structures including tree platforms, ramada-like shade shelters, and brush fences, according to national forest officials. “Wickiups and other aboriginal wooden features, such as tree platforms and brush fences, were once commonplace in Colorado,” said Brian Ferebee, deputy regional forester for the U.S. Forest Service’s Rocky Mountain Region, in a press statement. The sites range from lone timber “shelves” or platforms made from aspen and piñon, to villages with as many as a dozen wooden features, according to researchers. The sites have been found throughout the Nuche’s historic range, from the Uncompahgre Plateau in southwestern Colorado to the drainages of the Colorado River and White Rivers farther north. Based on cues including tree-ring data and artifacts, some of the wickiups date back more than 200 years, but most appear to have been built and used from the mid- to late 19th century. Some of the sites have also continued to be used by modern Utes for ceremonial purposes, but had never been documented by forest service archaeologists. 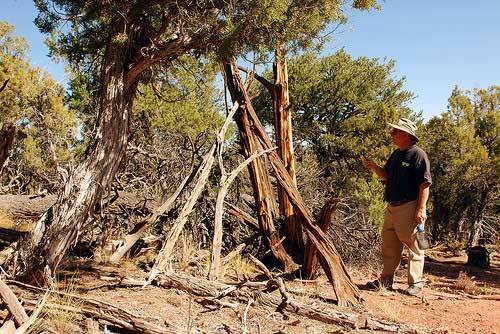 The structures were recorded as part of the Colorado Wickiup Project, an effort begun in 2004 by the Forest Service, and the Ute, Southern Ute, and Ute Mountain Ute tribes to find and document historic Nuche structures throughout Colorado. “We study the historic records of native peoples and use this to examine the archaeological documentation of abandoned habitations and campsites,” said Forest Service archaeologist Molly Westby. Although sometimes difficult to spot with an untrained eye, abandoned structures and other early historic Nuche features probably number as many as 800 in Colorado’s western forests, according to the Dominguez Archaeological Research Group, a partner in the project. Wickiups — known to the Nuche as kunnee — were built either as free-standing structures or as lean-to’s against trees, with narrow poles forming a framework that was covered with brush, bark, hide or, later, canvas. The bases were often secured with stones, and canvas doorflaps could be secured with wooden anchors in the ground, some of which remain. thank you for presenting this article. I have been wanting to see a write up on it since I was taking classes and being taught by the archaeologists involve. In 1965, I and my new bride were near the south side of Canyon de Chelly when I spotted two different four post Navaho hogans from the end of the 18th cent. I wasn’t looking very hard so likely there were more. Any wooden structure made of some type of juniper wood will survive an long time in the open in the SW. A survey of these wooden structures in Eastern Arizona would provide much information about a cultural era we know very little about.